Our Rescue Me Stuffed Animal Team Building Workshop is all about challenging your team to expand their repertoire of problem-solving skills while they work through modules designed to teach the value of collaboration while you help equip first responders with Rescue Me for children in distress! Teams develop important work place skills by working through a series of fast-paced team challenges. Facilitators keep it fresh, fast-paced and non-threatening. 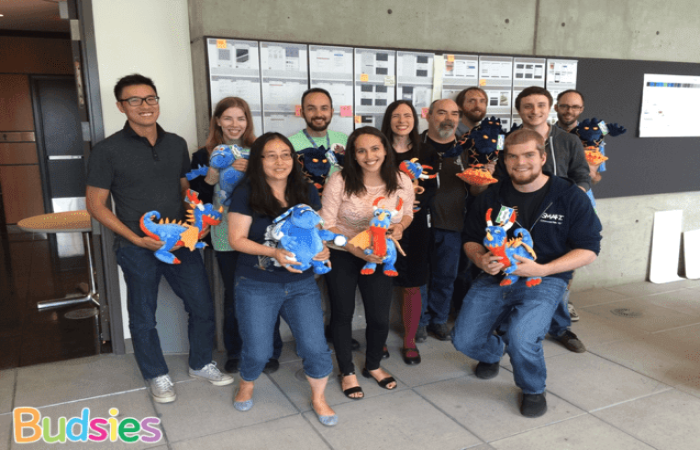 Assembling Stuffed Animals Leads to Positive Change? Yes! Building stuffed animals is the product, but the real goal is moving your group through a series of hands-on activities that will help guide them towards positive change. Individuals learn the value of their own input when it comes to achieving group goals. Teams learn the value of having everyone contribute as well as the advantage of having a diversity of styles on the team. It’s Not Just Positive Change for Your Team: It’s for the Community Too! Not only are you making inroads towards positive change in your team members, but you’re also making a real difference in people’s lives. By donating stuffed animals to first responders in your community, you’re assisting them with the vital work they do. You see, fire rescue crews, police officers and EMT professionals often encounter children experiencing trauma, shock, distress or loss. By personally handing a child a special Rescue Buddy, a first responder offers comfort amidst a traumatic event for the child. And where do these Rescue Me come from? Very often they pay for them out of their own pockets. Our Rescue Me workshop aims to help these first responders by donating stuffed animals. Whenever it’s possible, we’ll arrange for representatives from local emergency responders to receive the stuffed animals in person. It’s your opportunity to make lasting memories and form connections with the local community. Very often they’ll share with your group stories of how stuffed animals have made a real difference with kids on the job. Let us customize The Rescue Me Workshop for you. If you have a first responder group you’d like to work with, simply let us know and we’ll connect with them and make all the arrangements.